Have you found a rosette yet? About twenty-five years ago, a small scrap of wallpaper was found in Somerset House, a major 18th c London building. It was a mint green paper with a slightly darker simple rosette motif. Dated to 1790-1800, they were subsequently reproduced for a number of interior and restoration projects. And that was it…or so we thought. About ten years ago in the former Hanseatic town of Zwolle (The Netherlands) a similar rosette paper was found, in a two colour print, white with a black centre, on an orange ground. 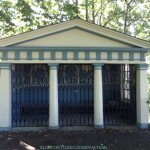 And then – two more colour variations were found in the Paviljoen Welgelegen (Haarlem, The Netherlands), the 1789 summer retreat of the Amsterdam based, Anglo-American banker Henry Hope. The study of how the individual wallpapers were actually made was done in the course of reconstructing the papers. In the process of reconstruction the conservator and the designer worked together in studying the texture, colours, printing techniques and application of the wallpapers. Discoveries were made, such as the proof that all four wallpapers were printed from the same blocks but with a different printing technique resulting in extremely clever colour and pattern permutations. The discovery of yet another variation in Horace Walpole’s Strawberry Hill (Twickenham) led us to the direction of Thomas Bromwich, a London based paper-stainer trading from 1761. Now it was clear that his client base apparently reached from Continental Europe, including Great Britain, to America. This discovery is new to the field of wallpaper research, as it is generally assumed that materials for surface decoration were sourced locally. This occasion, of course, triggered comparisons for other wallpapers as well. It was discovered that a different pattern was traded to Ireland, Great Britain and Boston; all manufactured from the same blocks, in varying colours with possibly one copied from the other two. It was also found that yet another pattern (copied from a printed Parisian printed textile), was manufactured as a wallpaper in London and traded to The Netherlands and Boston.